We will pick you up from your hotel in Aswan then drive about 3 hours to Luxor, start at west bank where you will explore the Valley of the Kings, the magnificence of ancient Egypt architecture. In the Valley of Kings there are 62 kings of the new kingdom are buried, the must see tombs are for King Tutmosis I, Tutmosis III, Tutankhamon, Ramssess VI, Mrenptah and AmonhotepII. Explore Al Deir Al bahary temple of Queen Hatshepsut, established and devoted to the famous Queen Hatshepsut, daughter of king Thutmosis I, she was the only female ruler of Egypt for 20 years in the 18th Dynasty. 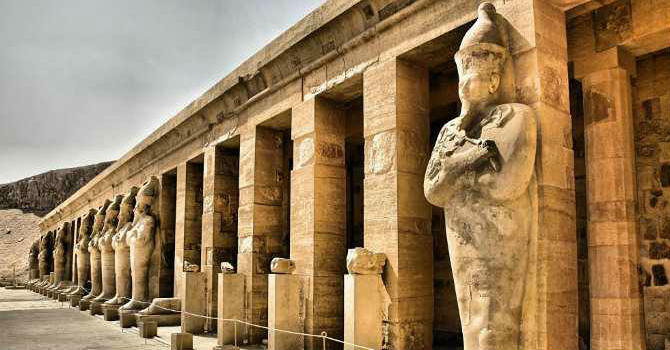 In the way to the Luxor eastern bank you will stop to wander the Colossi of Memnon which are the remains of king Amenhotep III mortuary temple then you will continue driving to get your lunch meal in local restaurant. Visit the temples of Karnak, believed to be the biggest example of cult temples in history, devoted to the sun God Amon, his wife Mut and their son Khonsu. Lastly you will visit the Luxor temple established by king Amunhotep III in eighteenth Dynasty of the New Kingdom then completed by Ramesses II in the nineteenth dynasty. Back to your hotel.